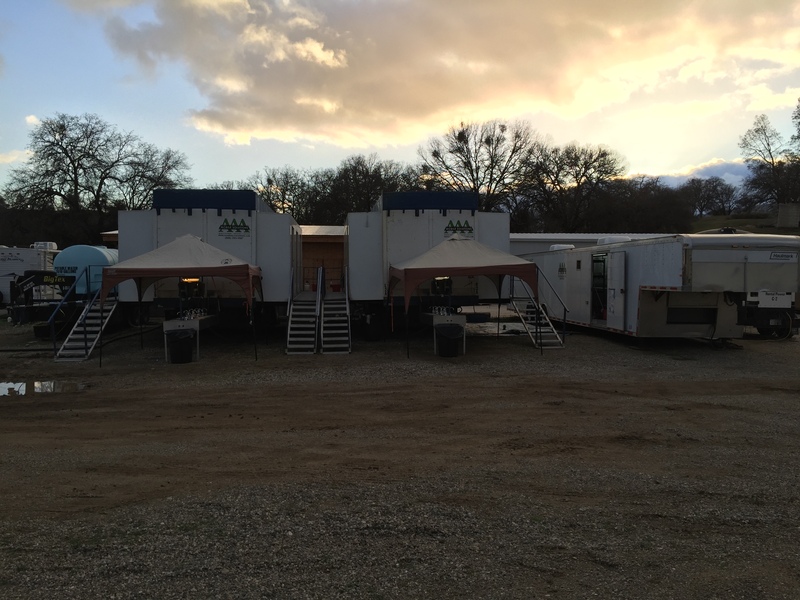 The AAA team is back on-site at Fort Hunter Liggett in Jolon, CA. We’re coming back from a 10 day break feeling refreshed and ready to help keep the soldiers clean. Our dynamic duo Jackie and Charlie are staying onsite 24/7 to manage A-2, our 24-head shower unit, along with L-5, a 10 washer/dryer mobile laundry. Check out the cool pic of the shower crossing the overflowing creek back in late January when it was still pouring cats and dogs! In the other picture, you can see the set-up of our entire operation out there, with the sun rising beautifully in the background.